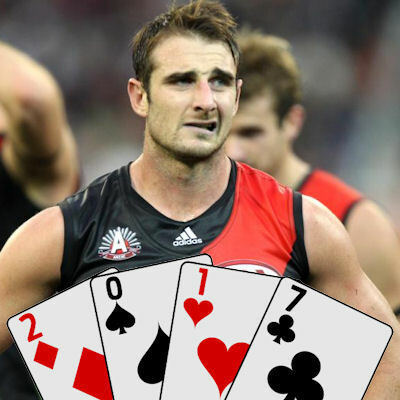 Warnie looks at the heavily discounted Brownlow Medallist Jobe Watson in today’s Deck. A few days ago I wrote about Dyson Heppell and am of the feeling that the Bombers were naturally discounted due to a poor 2015. They of course received a 10% discount after their year out of the game making them all priced well below their projected, let alone best, output. Jobe Watson is one of the biggest bargains if we delve into his history. The former Bomber captain is priced based on his 2015 average of 88.8. So 10% off that puts him at about 80. He hasn’t been priced this cheap since his fourth season in 2006. So looking at those numbers, he has averaged more than 80 for the last decade. More importantly, his season averaged since 2009 read 91, 95, 100, 112, 99, 104 and then his most recent 89. That 112 was a standout for Watson, playing all 22 games (the only time he has in his career)… and it was the season he ‘won’ the Brownlow and the supplements saga was based around. That year was 2012. Let’s forget that one for the sake of Roy interjecting with his asterisk comments. I’m going to call Jobe Watson a 100 averaging player. That is fair? Yes? I’ve predicted him to average approximately 97, which would see him make more than $100K if he can pump that out over the first few weeks. Like I mentioned with Heppell, the round 13 bye is a good thing with the Bombers – and Watson – as you can move them onto a fallen premium when you do your tactical bye trading. There are a few questions. Handing in the Brownlow would have been tough. The whole four years has clearly been tough for Watson who has pretty much copped more than any other player out of this hideous ordeal. He’s questioned his love for the game. He won’t be captain this year. While he came back looking in good shape, he spent the year pouring coffees in New York. The Essendon midfield has more depth and the future is coming through and will be getting plenty of clock. Jobe’s midfield time will be as low as it has been in the last few years with the likes of Merrett and Parish seeing longer stints in the guts. I see Jobe playing a lot on the half-forward line, or even deeper inside 50, as he can hit the scoreboard and use his 190cm frame to provide contests and support Joe Daniher up there. Injuries have plagued Watson’s career. As mentioned earlier, he has only played one full season in his 14 years in the system. In 2015 it was just 12 and 2014 was 14. Shoulder injuries, soft tissue – such as hamstrings – have limited his output. This is a concern, especially for when/if you take him in the Draft format. JACK – Looking at the ownership figures in the Drawing Board, I was surprised to see Watson owned by just 6% of coaches. I totally get it, but there is limited risk in AFL Fantasy Classic with two trades per week. Jobe’s head is going to be fine. It could be his last season and he is a proud man. The burden of the last five years is now behind him and I believe he will be an asset to the Bombers and our Fantasy squads. That 97 average doesn’t make him a keeper, but he’ll make some cash and let us shuffle the deck chairs when we need to. Marc Murphy is around the same price… maybe you take the Blue over him? I’m not sure. It’s a toss of a coin for me. Certainly track him this pre-season and even with less midfield time, he’s going to be a solid option. And hey, if he plays forward a lot – what a great DPP we could have in round six or 12! How many points does Jobe Watson add to the 80 he is priced at? Good article but I’ve gone guns and rooks and have heppell at m5. Whole season off and if he’s looked after himself correctly could see him back at close to his best if a bit rusty. Pre-season watch definitely, if not close to number one watch for me. Great write up Warnie ! So many questions. Headspace, match fitness, role, durability. If the answer to one of those is no, it’s a failed pick. What’s the chance of flipping a coin and it coming up heads 4, or 5, or 6 times in a row? It’s possible, but like you Warnedog, I’m seeing Watson as a mid-90’s guy who is unlikely to play more than 20 games. I can only have 2/3 of Beams, Murphy & Jobe. But which 2? Pre season watch on Jobe (intra club he played in the guts) but if splitting time fwd I have to pass.